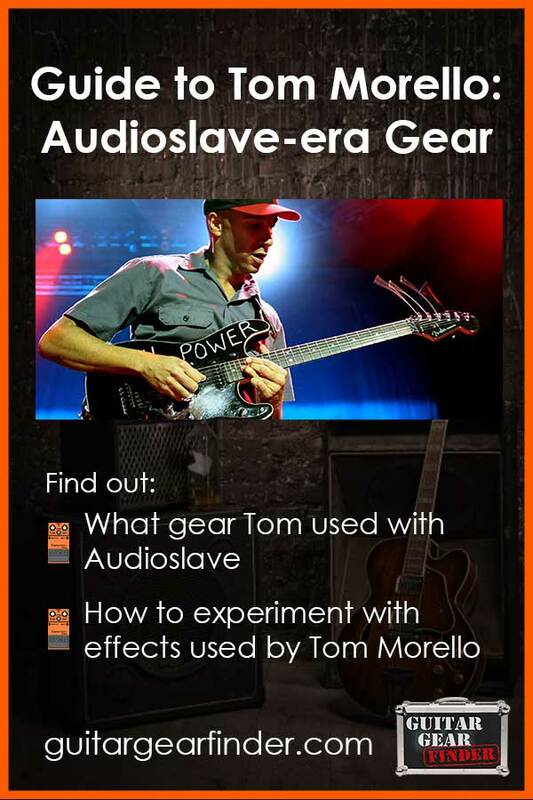 This guide will look at Tom Morello’s guitar rig during his Audioslave years. His rig slightly changed during Audioslave compared to his Rage Against the Machine rig so check this guide out if you want to see what he used during RATM. As explained in the RATM rig guide, Tom isn’t too big on high quality guitars. Many of the guitars he used throughout his career were purchased really cheap and didn’t have the best hardware. This is an important point as many people get overly focused on getting the best possible guitar hardware possible. As Tom explains in many interviews, worrying too much about your gear takes away from thinking about the music. The ‘Soul Power’ guitar (shown to the right) was used for all of Audioslave’s standard tuning songs. As Tom explains in the above video, he chose this guitar to achieve a different tone compared to RATM. The guitar was originally a factory run special for Guitar Center. It’s a Fender Stratocaster, has an Ibanez Edge double-locking tremolo with a Seymour Duncan Hotrails pickup in the bridge position and Fender Noiseless pickups in the middle and neck positions. The guitar is fitted with a 2-way toggle switch to be used as a killswitch (explained later). The main point to keep in mind to achieve an Audioslave like tone is to use single coil pickups when possible. Tom tends to prefer using the neck pickup for a smoother tone so even if you don’t have single coil pickups, try using your neck pickup. Just like in Rage Against the Machine, an important aspect of Tom’s unique style is the use of a killswitch. A killswitch simply allows you to cut your guitar’s signal completely with a flick of a switch or hit of a button. While Tom does use the killswitch in many Audioslave solos, he used it more widely in RATM. Check out the RATM guide here for examples of the songs he used the killswitch on. 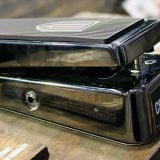 If your guitar has a volume knob for each pickup and a three way selector, you can simply roll the volume of one of the pickups to zero and the volume for the other pickup at maximum. Then when you toggle between the two pickups it will cut in and out. This approach obviously only works with guitars with two volume knobs, so if you don’t have one, you will need to take the other approach. It’s quite easy to install a killswitch into your own guitar. The ‘Soul Power’ guitar mentioned above that Tom used throughout Audioslave didn’t originally have a killswitch. Tom installed a 2 way toggle switch and wired it up as a killswitch. 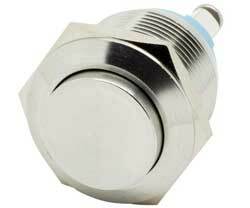 To install a killsiwtch you can either install a two way toggle switch or a momentary button. Either one will do the same job but they feel different to use. 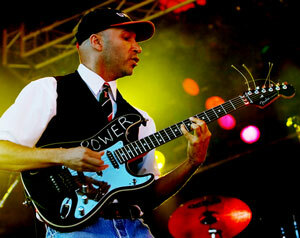 Tom uses a two way toggle switch as seen on his Soul Power guitar. That toggle allows him to get a firm grip on the switch and gives him a bit more control. Alternatively a momentary button allows you to simply tap when you want your tone to cut out. Other guitarists prefer a momentary switch simply because it’s a bit quicker and easier to use. Tom’s amp remained the same from RATM to Audioslave. He uses a 50 watt Marshall JCM 800 2205 head and a 4×12 Peavey cabinet. While the JCM 800 has two channels, Tom only uses the overdrive channel (as explained later). 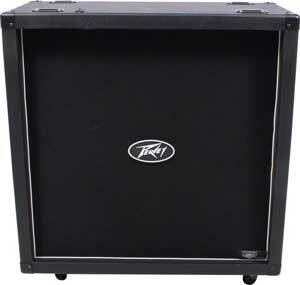 Tom uses a straight-front Peavey 4×12 cabinet similar to this Peavey cabinet as shown below. While that’s the gear Tom uses live, you can use almost any amp and cabinet to achieve the same tone. As long as the amp you use has a nice overdrive (or you use a decent overdrive pedal) – you’ll be able to get pretty close to a Tom Morello tone. You can also see in the video that he has a variety of amps available in his studio so he no doubt experiments with different amps for recordings. 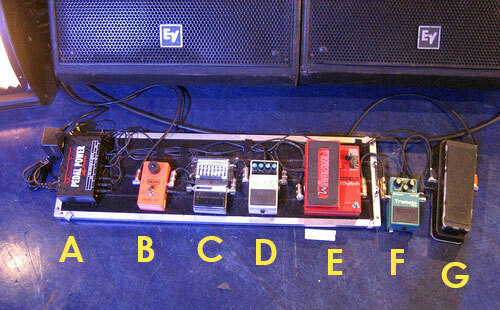 The below photo shows Tom Morello’s Audioslave pedalboard. There’s a few changes and additions compared to his RATM pedalboard, so let’s go through each pedal. The Voodoo Lab Pedal Power 2 Plus is a great pedalboard power supply which I reviewed here. It’s not essential but far better than having individual power supplies for each pedal or using batteries. If you plan on building a large pedalboard, I highly recommend getting a dedicated power supply to power your pedals. 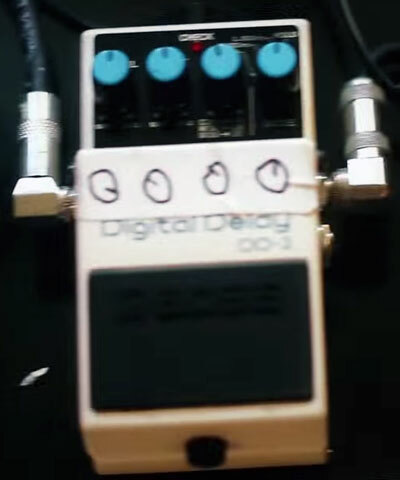 During RATM Tom used an Ibanez DFL Flanger. The MXR Phase 90 replaced that pedal during Audioslave. The difference is that he has moved from a flanger to a phaser. They produce similar effects yet very different tonal qualities. When you hear a live version of Tom playing RATM songs with the MXR 90, you can easily hear how it changes the tone compared to the recordings with the flanger. It’s worth mentioning that the MXR Phase 90 is the last pedal in Tom’s effects chain before being sent back to the amp. This means the Phase 90 is the last effect to color his tone (if it is used). If you do decide to build a pedalboard with these effects, I recommend experimenting with different pedal orders to hear how changing the order of pedals affects the end result. Electro Harmonix Small Stone Nano – this is a very popular phaser pedal and like the MXR Phase 90 it only has one control knob. This one also has a color toggle switch so you do have some extra flexibility. Joyo JF-06 Vintage Phase – if you’re looking for a super cheap option, this one is less than half the price of the MXR or the EHX. 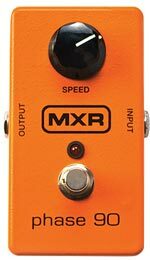 It’s basically a clone of the MXR Phase 90. 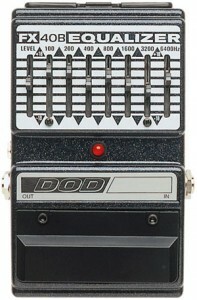 Tom uses a DODFX40B EQ pedal as a booster for solos. He sets the EQ parameters to a flat response and simply uses it to raise the output level. Tom has used this pedal from his RATM days through his Audioslave days and continues to use it today. As you can see it is almost completely flat. There is a slight dip in the fifth slider from the left which is the 800Hz band. But you can see overall it’s a very flat setting with the aim of using it simply as a booster. Delay is such a common effect yet Tom still manages to get the most out of it. The most obvious use of delay is in the beginning of Cochise. Tom sets his delay to a fast slapback with high feedback to basically double up and produce the helicopter like sound. 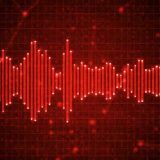 You will hear a slapback type delay used throughout a lot of Audioslave songs as it is a great way to thicken up his tone. 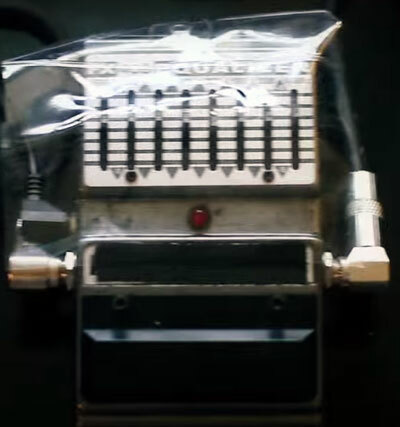 For example in the Like a Stone solo, you can hear how the delay is used to enhance the whammy pitch shifting. The delay fills out his tone to produce a bigger sound. If you want to produce a great Audioslave tone, then a delay pedal is essential. The sticker shows settings he uses although it’s likely to change depending on the song played. So use the above settings as a good starting point, then experiment with changing the settings for each Audioslave song you play. It’s interesting to point out that the effect level is cranked up and he uses the ‘Long’ delay mode. This is the crucial pedal you should buy if you want to sound like Tom Morello. It’s such an iconic effect and Tom really gets the most out of it. Tom used it throughout RATM in songs such as Know Your Enemy, Bullet in the head, Ashes in the fall and Killing in the name and continued to use it in Audioslave. The most well-known use is the solo in Like a Stone. Other Audioslave songs such as Revelations, Cochise and The Worm all use the Whammy in creative ways. Check out my Whammy Pedal lesson here which includes how to play the solo from Like a Stone. 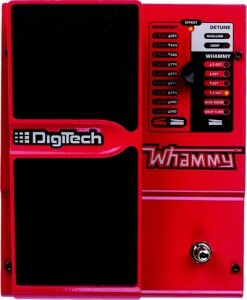 A Digitech Whammy really is a pedal any Tom Morello fan should consider buying. It would be almost impossible to reproduce a lot of Tom’s unique solos without a Whammy. There are not many guitar pedals out there that are as fun to use as a Whammy. It’s a great creativity tool and simply fun to jam with. The TR-2 was a new addition to Tom’s pedalboard during Audioslave. While he does achieve a tremolo-like effect with his killswitch, the tremolo pedal allows him to have a wider range of tremolo effects such as the effect used in Like a Stone. Another clear use of the TR-2 is during the verse in Gasoline. Unlike the subtle effect in Like a Stone, Tom cranks the Tremolo up so his signal cuts in and out – similar to his killswitch technique. The BOSS TR-2 is a great pedal to use on a clean tone although Tom does also use it on distorted tones in Audioslave songs. For other options, check out my Guide to Tremolo Pedals here. Tom uses a wah in a lot of Audioslave and RATM solos. If you had to pick only two pedals out of Tom’s pedalboard to buy, it should be a wah and a whammy. Those two effects are incredibly fun to use and cover a lot of Audioslave songs. The solo in Be Yourself is a simple, yet incredibly effective way Tom uses the wah to add a lot of character to his solos. Other songs include Original Fire, Doesn’t Remind Me and What You Are are worth checking out to see how Tom uses the wah in creative ways. 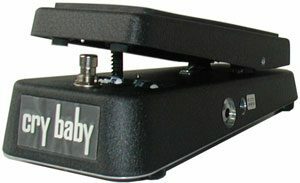 My recommendation is to buy a wah pedal that suits your needs rather than buy the Cry Baby simply because that’s what Tom uses. 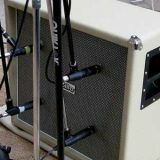 For example I prefer a wah pedal with extra control over the tone which is why I use a Vox Big Bad Wah (read my review here). Alternatively if you’re looking for a basic option, check out my review of the Original Crybaby here. This rig makes use of the amp’s effects loop. It’s a very different approach to how most guitarists run their rigs. All pedals are placed within the amp’s FX loop – including the wah which is usually placed before the amp. Of course you should experiment with placing different pedals outside of the FX loop as you may prefer some to be positioned before the amp’s drive. If you use an overdrive/distortion pedal in addition to any of the above pedals, that would be a good example of pedals needing to be placed before the amp. When you compare Tom’s rig during Audioslave and the rig for RATM, you can see that there’s very little changes. Yet Tom was able to achieve a lot of wacky sounds in his solos from those minor changes. That’s because he works hard to get the most out of every pedal. Quite often new students come to me with a pedalboard full of effect pedals. Yet they don’t know how to get the most out of each pedal. When Tom added the TR-2 to his rig, he was able to experiment with tremolo effects he previously could only achieve with his killswitch. Then all of a sudden he had a lot more control over the same effect. I encourage my students to experiment with one effect pedal at a time. That’s how you learn to get the most out of your gear. Start off with the Whammy and nothing else and see how many different ideas you can come up with. Then do the same thing with a wah. Then see how many ideas you can come up with using a delay pedal. Experiment with one pedal at a time to really learn how to get the most out of it. Then you can start combining effects. For example combine the whammy with the wah – something Tom does quite often in both RATM and Audioslave. Try different settings on the whammy and use the wah as a filter. Or use the whammy and wah at the same time using two feet. Tom Morello is a guitarist who has created a lot of unique effects with a fairly simple rig. 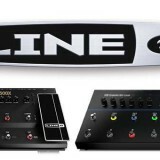 If you do buy the above effect pedals to replicate his rig, make sure you spend time with each one. Check out my guide on Tom’s RATM rig for more tips on how to get the most out of your gear. Learn about Tom Morello's rig and effects in Audioslave here. Find out what pedals he uses and how he comes up with his unique sounds.